Formerly known as NYLO Dallas South Side, CANVAS is created and managed by INTRIGUE Hotels & Resorts, the independent lifestyle division of Interstate Hotels & Resorts. "CANVAS Dallas Hotel is a timely addition to the burgeoning district of South Dallas," said Jack Matthews, president of Matthews Southwest, lead developer and co-owner. "With a prime location in the heart of the Cedars district, and in close proximity to downtown and the convention center, CANVAS is nestled in an eclectic neighborhood undergoing a renaissance in terms of culture, shopping, food, art, and music. 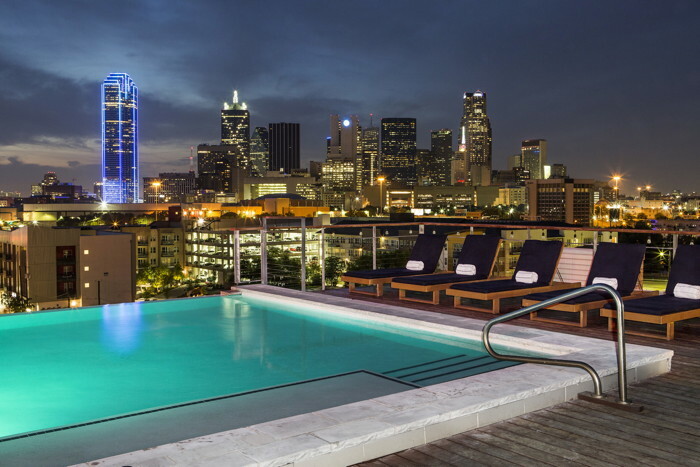 This property is poised to be the destination of choice for modern travelers looking for an authentic Dallas experience that will inspire their creativity and satisfy their contemporary tastes." Upon entering, guests are made to feel right at home in the refreshed first-level lobby and restaurant with elements that portray a living room-feel. Intimate seating areas foster common social spaces in the eclectic industrial space, adorned with locally discovered and bespoke accessories from the Dallas area. The restaurant's dining area converts into flexible meeting space, divided by a sliding glass partition. From palette to palate, CANVAS Hotel Dallas brings two art-inspired restaurants and lounges to the South Side of Dallas. Chef's Palette is the redesigned first-level lounge and restaurant where every plate is a tasteful expression of culinary creation. From the plating, to the colorful ingredients and inventive use of new culinary techniques, Chef's Palette offers small plates, entrées, and cocktails that are just as visually appealing as they are palate pleasing. Whether you're stopping by for a morning start, a mid-day meeting, or an expressive way to end your day, the menu and décor at Chef's Palette will arouse your senses, and likely, awaken your inner art critic. Signature menu items include a Texan-style eggs benedict with bloody mary-infused hollandaise and flights of Mexican ceviche. "The entire guest experience at CANVAS is centered around a taste of local artistry, whether through the art on the walls or on the plate," said Jared Williams, general manager. "Our talented team of individuals has curated incredible menus and rotating art collections, met with welcoming hospitality to give each of our guests an authentically Dallas experience you won't find elsewhere." The rooftop bar formerly known as SODA has been redesigned and renamed The Gallery Rooftop Lounge. The indoor / outdoor lounge offers a sweeping 270-degree view of the Dallas skyline, but the vista isn't the only masterpiece at The Gallery. From chef-centric food offerings, to handcrafted cocktails and eclectic art by up-and-coming Dallas artists, everything at The Gallery Rooftop Lounge is an ode to originality. There are even painting stations at prime viewpoints on the patio at which guest artists can set up and create. So, whether you're a hotel guest visiting Dallas for the first time – or a local taking in the best view of the city you call home – The Gallery Rooftop Lounge is open and ready to inspire. Are you with Interstate Hotels & Resorts? If you are a member of Interstate Hotels & Resorts you may be interested in learning how to optimize your content on our network.